Combination of Lime, Lemon, Ginger and Cinnamon bark essential oils. This oil blend may help jump start your day. 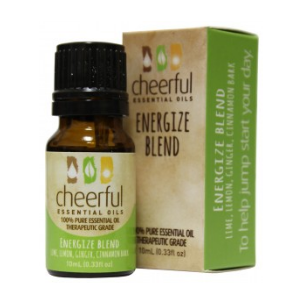 Energize Blend combines Lime, Lemon, Ginger and Cinnamon Bark to help jump start your day. Lime essential oil may help restore energy to help start your day. The lemon oil can help with cleansing and purification which can help improve your mood. Cinnamon bark oil can help stimulate the immune system and increase circulation. Ginger oil is stimulating and may therefore relieve depression, mental stress and exhaustion. The combination of all of these creates a wonderful blend that can help energize your day.